Despite the winter storms, we’re looking ahead to the coming honey flow and what we can do differently with this year’s harvest. Specifically, we’re thinking of how to infuse honey with natural flavors to bring something new to our customers. There’s no doubt that raw honey is delicious. Infusing honey that you’ve pulled from your hives, or even honey you’ve purchased from a local beekeeper, is a great way to add to that amazing flavor. 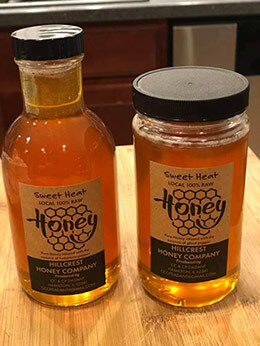 The method is really quite simple: Take your honey, add your chosen flavoring ingredients, filter and bottle the result, and enjoy sharing your creation! Even though we’ve still got months of white stuff ahead of us in the Midwest, we can’t help but dream of green pastures and bottling loads of liquid gold this honey season. All this daydreaming has us thinking: What can we do differently this year for our honey customers? Our answer: Infused Honey. Infusing honey typically works best by starting with a light, mild-flavored honey to avoid conflicting flavor profiles. Use dried herbs, spices, fruits or even nuts to add flavor to your honey. Be sure to use fully dried products, as fresh items can lead to contamination and mold. For infusing the honey, we suggest using Large Bulk Containers that hold between three and 60 pounds of honey. For bottling the finished product, smaller honey containers are perfect for storage, sharing or selling. Be sure to use food grade containers during all stages of the process! Once you’ve infused the honey, you’ll need filters for the bottling process. Our Bottling Bucket Kit is perfect for this task. According to the National Honey Board, there are more than 300 unique types of honey in the United States, each originating from different floral sources. These varietals can range in color from very light and nearly colorless to dark brown and even reddish in tint. Some of the more common honey varietals are Orange Blossom, Clover and Wildflower. While most beekeepers have a good idea of the floral sources available to their bees, some tasters may not pick up on these floral differences. The Honey Flavor Wheel created by the UC Davis Honey and Pollination Center can help determine the floral source based on flavor profiles present in the honey. When it comes to choosing natural flavors for infusing honey, there are plenty of options. Dried herbs such as rosemary, ginger and mint add wonderful flavors to honey. Spices like cinnamon, cloves and star anise add a kick that pairs beautifully with the sweetness of honey. A variety of dried fruits and vegetables, from lemons to hot peppers, can add their unique flavors to infused honey. Using dried nuts or coffee beans to infuse your honey can create complex and interesting flavor profiles. Can’t decide on just one flavoring ingredient? Try combining them! One of our favorite recipes is lemon-ginger infused honey. Have fun experimenting and discovering the endless possibilities. Remember, no matter what flavoring ingredients you pick, they should be completely dried with all moisture removed! For the best results, it’s important to balance the right amount of flavor for the amount of honey you’re working with. For example, if you are infusing a five-gallon bucket of honey, you’ll likely need a large amount of your flavoring ingredients and more time for all of the flavors to meld. However, the best way to determine the right amount of flavor is to keep tasting the infused honey every day or two. Larger batches will require some periodic light stirring, too, to keep the process efficient and even. Additionally, the strength of the flavoring ingredients you are using makes a big difference. For example, a habanero pepper can be more than 100x hotter than a jalapeño pepper, thus requiring fewer days in the honey to infuse the desired amount of heat. Dadant Pro Tip: When experimenting or trying new flavoring ingredients, write down the amounts used and the number of days it remained in the honey. Knowing if you should add more or less of certain ingredients may come in handy down the line. The last step is to filter your honey for bottling. For smaller batches, a simple kitchen strainer may be all you need. For larger batches, we like the Dadant bottling kit with reusable filters. Depending on the items used for flavoring, you may need an extra fine strainer to remove all of your ingredients from the honey. Glass jars and food grade plastic containers are great for bottling your infused honey. Muth jars, Hex jars and Skep jars remain very popular, as well as the always-favorite plastic honey bears for holding and displaying your liquid gold. Dadant Pro Tip: Filtering and bottling honey in a warm room helps the honey flow better. Spicy honey drizzled over grilled pork chops or baked brie cheese. Garlic-rosemary honey spread over fresh-baked bread. Lemon-mint honey in cocktails, strawberry lemonade or iced tea. We can’t wait for the cold months to pass and to see our bees start foraging again. In the meantime, we’ll cozy up to the fire and keep thinking up new flavor ideas for infusing honey. If you have a favorite recipe for creating or using infused honey, let us know on our Facebook page! Give us a call at 888.922.1293 or contact the closest Dadant branch.